If you’re a parent then a Birthday for one of your children will be a familiar occurrence. They come around once a year! And if it’s your daughters birthday then you will no doubt be looking to get her a gift and card. But are you worrying about what to write in that card. Well fear not. That’s why we’ve put together this large selection of Birthday wishes for daughters. Just read on. It’s understandable if you’re finding the words for a daughter’s birthday card tricky. Whilst a standard ‘Happy Birthday’ for an acquaintance or friend is easy enough to do, writing something touching and loving for your child (however old they are) can be daunting. You want to find the perfect phrase or words to express just how you’re feeling. Something that puts across the depth of love you have for her and the happiness she has bought to your life. That’s hard to do though, right? Thankfully the examples below should help you to get the perfect message. 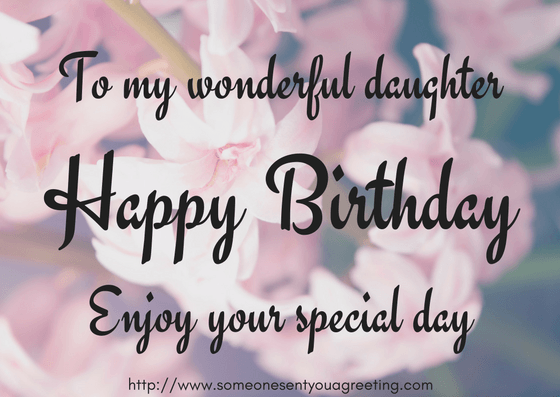 Be it for your younger child or your adult daughter, the birthday messages we’ve compiled will cover every scenario or type of message you want to say to your daughter. 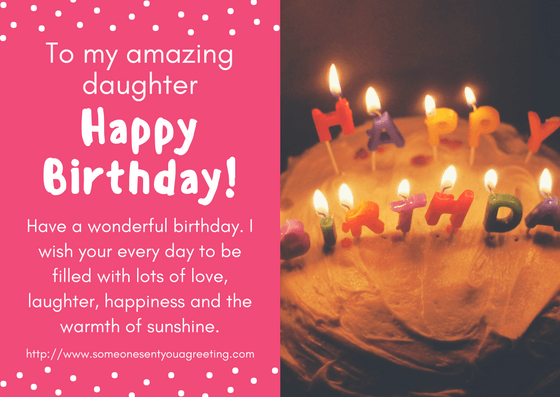 So if you are struggling with what to write or say then choose from messages below and they should help you find the best funny, touching and loving words for your daughter’s birthday. These wishes are fairly general and so should be suitable for most situations. Use them for wishing your daughter the happiest of birthdays. If you want a more specific message – funny or from a specific patent then scroll further down. This is just a quick reminder to let you know how much I treasure you. Have a truly happy birthday! The day you were born you stole my heart, and you haven’t given it back since. You mean the world to me, and I hope your birthday is filled with joy and love. Happy birthday to my little thief! Happy birthday to the most beautiful girl in the world (or even the universe!). These messages should really express how special your little princess is to you. Straight from the heart, bring tears to her (and probably your!) eyes with one of these emotional birthday wishes. Happy Birthday honey. Remember to always believe in yourself like we have. I don’t just appreciate the fact you’re my daughter. It’s all the little things you do that make you so special. Here’s to an awesome birthday! The world would be a less beautiful place without you, my gorgeous girl! Happy Birthday! From the day that the doctor put you into my arms, I knew my life would never be empty again. I love you so much, princess. You fill my heart with happiness every blessed day – from the time I open my eyes in the morning until the time I close them at night. I will always have my best friend in you, my dearest daughter. Every blessed day I love you more and more. Happy birthday. As you celebrate your birthday, always remember that Mommy and Daddy love you so much and will do everything within our power to ensure that your journey in life is as smooth as possible. Happy birthday. Birthdays should be filled with joy and laughter. So put a big smile on your daughters face with a funny Birthday message. Sweetheart, we planned to make your day the most special one possible for you, we got the most expressive version of your favorite cake, put up your favorite decorations and bought what we hope would be your favorite present in the whole world! But then I read this article online about spoiled kids and I changed my mind. You’ll understand when you’re older! Happy Birthday! I will do everything I can to make you happy, including not over interrogating your next boyfriend when he comes visiting you. Happy birthday. I have never been prouder of you than I am this year. And that’s saying something because the first time I saw you walk, I cried. Happy Birthday my baby! I got the date right this year! Score! Happy Birthday! Hey, you know you’ll always be our little princess! Just keep in mind sometimes the crown will be taken, and you might have to queue. Happy Birthday! We were wondering what gift to give you on your birthday, until we remembered that our lovely daughter already has the greatest gift in the world – her wonderful parents! Now that you’re an adult you’re allowed to do what you want and don’t have to follow my instructions. But that doesn’t mean I’m gonna stop giving them. Happy Birthday! No matter how old you become, even if you become as old and toothless as granny, you’ll always be my lovely, adorable, little baby girl. Happy birthday, little princess. On your birthday, I’m not going to remind you of how old you are because that would not only ruin your day, but also mine, since it would remind me of how old I really am! Happy birthday to my daughter who is fortunate enough to be one of the few people in my life whose Big Days I don’t need Facebook to help me remember. Use your card to say or write some special words from mother to daughter. Reaffirm that connection only a mom and her girl have with a touching message she can cherish. You will understand how much I love you the day you become a mother. Happy Birthday, my love! In mom school they warned us that at times our daughters might resent, disrespect, ignore and disagree with us. But the first lesson we learn as soon as they arrive is that, no matter what they do, we will always love them. Happy Birthday. My beautiful girl, happy birthday! The day you were born is one of the most memorable in my life. I will never forget the moment you were in m arms for the first time. I love you so much! Every year I come back to the day of your birthday to find you’re a little prettier, sweeter and funnier than last year! Here’s to the best daughter in the world. My daughter! You are the kindest and loveliest person I know. I am so happy to be your mother. Wishing you all the best on this special day! Your daughter might be daddy’s little girl or a grown up, independent young woman. Either way, you should use her Birthday to give a card that let’s her know just how special she is to you. A card full of beautiful words for your daughter that she can treasure and to be reminded of the relationship she and her dad have. I can’t believe you’re another year older. I wish I could slow down time and keep you as my special little girl. Happy Birthday! When you entered my life, everything became simply wonderful, in the truest sense of the word. Happy birthday, beautiful girl! No matter how old you are, you will always be my sweet little bundle of joy. Have a wonderful birthday! You give me a thousand more reasons to smile every blessed day. Happy birthday to you my beautiful daughter! May your life always be filled with happiness! Having you was a life’s decision, but loving you was a matter of a few moments. I wish you a happy and untroubled life, close to the ones you most love! Happy birthday! You are the most wonderful and precious gift I will be always grateful for that. Have a brilliant birthday! I thought that the most beautiful memory of my life would be the moment I held your tiny fingers for the first time. But every single priceless moment of watching you grow up has made my life as beautiful as a lovely rhyme. Happy birthday. Just watching you grow up brings a smile to my face. Always remember that my love for you is a limitless oasis. Happy birthday. Want something a little extra special? Try a poem dedicated to your daughter on her birthday. 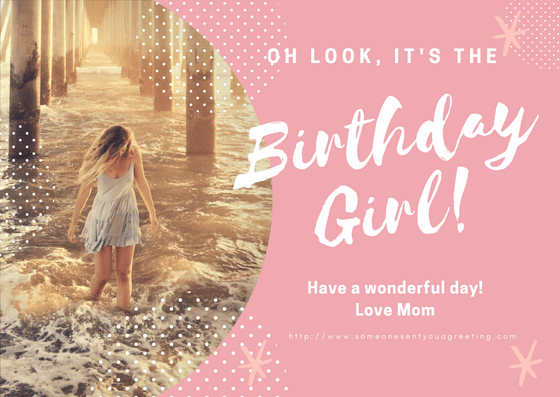 A thoughtful or sentimental poem that talks about how blessed you’ve been to have a daughter could be the perfect inclusion for your birthday card.